J.F.K. was one of the most popular and charismatic American presidents, whose inaugural speech is now part of history textbooks. His assassination by a lone gunman sparked off a frenzy of grief and became the subject of countless books, movies and newspaper and magazine articles. But how well do you know your J.F.K.? 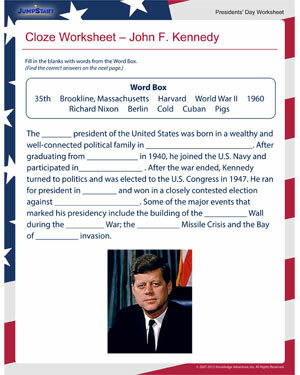 Check out this printable Presidents’ Day worksheet and find out. Also browse through these interesting Presidents’ Day resources for kids.